Since 1968, we've been dedicated to providing the absolute best residential plumbing, heating, and cooling repair and service in Richmond, and throughout central Virginia. We understand it's impossible to live comfortably without working plumbing & HVAC in your home. You can reach us by dialing 804-358-6322. Call today and we will take good care of you! 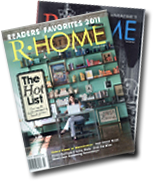 For three year in a row, Carroll Plumbing & Heating, Inc. was named one of Richmond's Favorite Plumber in R-Home magazine!